Claxton is a small parish in south Norfolk, southeast of Rockland St Mary and north of Carleton St Peter. The parish is bounded by the River Yare and Claxton Marshes to the north. Much of the land is heavily drained and managed farmland and consequently the archaeology reflects the struggle to maintain this drained land such as drainage pumps. The modern settlement is now rather dwindled and is spread out between the Manor House and the main settlement of Claxton itself whilst the church is further to the south of the parish. The village name is a combination of Old English and Old Norse and is recorded in the Domesday Book demonstrating the antiquity of the settlement. The name has been translated as ‘Klakkr’s enclosure’. The earliest evidence for human activity in the area is casual finds of Neolithic worked flints (NHER 10303). These include two Neolithic flint axeheads (NHER 10301 and 10302). These are concentrated at Claxton Corner suggesting Neolithic activity may also have been concentrated here. Analysis of aerial photographs of the parish has revealed the presence of an undated circular enclosure around a building where some Iron Age pottery (NHER 32083) has been recovered. Roman pottery (NHER 38081) has only been found at one site within the parish. Saxon pottery (NHER 31530, 32083 and 38081) has however been found at three sites suggesting that activity may have been intensifying during this period. This ties in well with the probable Saxon formation of the village. The ruins of <?xml:namespace prefix = st1 ns = "urn:schemas-microsoft-com:office:smarttags" />Claxton Castle. In the medieval period we see extensive development and this may relate to the drainage of the marshes and gradual increase in agricultural productivity of the land. Claxton Castle (NHER 10304) was built in the medieval period, and nearby medieval masonry (NHER 40311) may have been related to the castle. Two medieval chapels (NHER 12386 and 12387) have also been recorded in the castle’s grounds although their exact location is now lost. St Andrew’s Church (NHER 10333) is situated a long distance from the modern village and it is possible that was also previously a centre for medieval occupation although no other finds have been made here. A medieval farmstead (NHER 17323) has been identified just off Folly Lane. The area seems to have been quite intensively occupied and farmed in the medieval period. 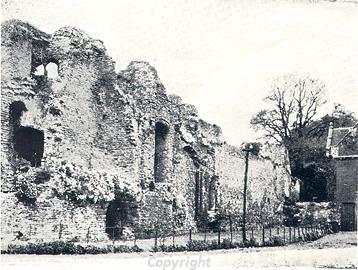 In the post medieval period the castle fell into disrepair and two later buildings were built within its remains. The 17th century Claxton Manor (NHER 10304) is still standing. The windpump (NHER 10262) on the River Yare drained the marshes until it was replaced first with a steam powered pump in the 1920s and later with an electric one that still runs. In the modern period a tramline (NHER 13751) was built from near the church to the River Yare to carry sugar beet to barges waiting to take it to Cantley factory. The tramline was removed in the 1940s. Megan Dennis (NLA), 14th September 2005.
http://www.norfolkchurches.co.uk/claxton/claxton.htm. Accessed 8 February 2006.
http://www.roll-of-honour.com/Norfolk/Claxton.html. Accessed 8 February 2006.